Scholarly exploration and intellectual discourse take place at our interdisciplinary centers and institutes. Building on our tradition of deep scholarly inquiry, students have the opportunity to work side-by-side with faculty and visiting scholars at an array of centers and institutes that foster research, fuel policy debates, and promote public discussion about pressing social issues. Our centers and institutes address topics, such as global migration, democracy, design and ethnography, and capitalism. 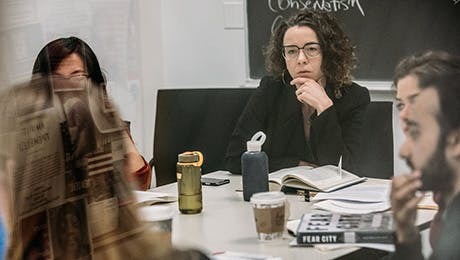 At the Robert L. Heilbroner Center for Capitalism Studies, faculty and students come together for interdisciplinary discussions about theoretical approaches to-and analytic methods for-the study of capitalism in its myriad forms. The Schwartz Center for Economic Policy Analysis (SCEPA) is an economic policy research think tank where New School economists and researchers debate the role government can and should play in the economy to raise living standards, create economic security, and attain full employment. The Zolberg Institute on Migration and Mobility provides a forum for research and scholarship, policy debate, and discussion with activists and artists around issues of global migration and mobility, their economic impact, political consequences and their meaning for issues of citizenship and identity. The Graduate Institute for Design, Ethnography & Social Thought (GIDEST) incubates advanced research at the intersection of social theory and design, fostering dialogue on related themes across the university. The Center for Public Scholarship seeks to promote free inquiry and public discussion, bringing the best scholarship in and outside the academy to bear on the critical and contested issues of our times. The Sandor Ferenczi Center sponsors lectures, conferences, and workshops relevant to Sandor Ferenczi's legacy of clinical innovation and contributes to the ongoing vitality of psychoanalysis as a cultural, intellectual, and therapeutic discipline. Hannah Arendt, widely acknowledged today as one of the most influential philosophers of the 20th century, taught at The New School as a university professor from 1967 until her death in 1975. The Hannah Arendt Center is dedicated to preserving Arendt's legacy and fostering the kind of participation in public life she exemplified. The Center for Attachment Research (CAR) engages in the application of attachment theory to clinical and developmental research questions concerning child, parent, and family development. The Institute for Critical Social Inquiry (ICSI) provides graduate students and faculty from around the world with the opportunity to work closely with some of the most distinguished thinkers shaping the course of contemporary social inquiry. The Janey Program in Latin American Studies supports fellowships for students from Latin America and the Caribbean pursuing graduate studies at The New School, summer fellowships for fieldwork and research in Latin America and the Caribbean, an annual conference, lectures, and occasional visits to The New School by scholars from Latin America. The Transregional Center for Democratic Studies (TCDS) offers unique opportunities for global advanced research and cross-cultural collaboration. Its projects address democratic transitions, the workings of collective memory, and-increasingly important in times of massive migrations-the development of a "culture of borderlands" and an "ethos of border thinking" in order to promote a general openness to difference, hybridity, and diversity in civil society and civic life. The Center for Research with Infants and Toddlers explores the development of conceptual understanding in infants and young children, focusing on how they come to make sense of the social worlds around them. The NSSR Memory Studies Network brings together leading scholars in the field and graduate students from different parts of the university-social science, arts and design, and humanities-creating a special space for interdisciplinary discussion, scholarly innovation, and international exchanges of ideas, thus advancing discourse in the field. The New University in Exile Consortium (New UIE Consortium), is an initiative created by The New School to confront today’s surging threats to scholars around the world; it consists of a group of like-minded colleges and universities, each of which is committed to hosting at least one endangered scholar.